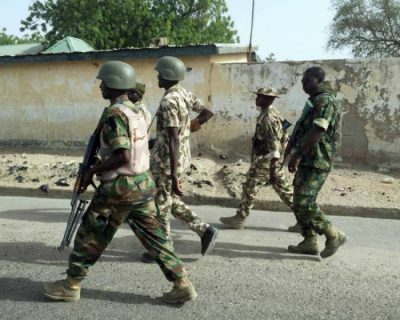 The Nigerian army says three members of the Islamic Movement in Nigeria (IMN) were killed after they attacked troops deployed to a checkpoint at Kugbo/Karu bridge in Abuja. The army said four soldiers were wounded in the altercation which took place on Monday. The IMN members were conducting the Arbaeen Trek when the fracas occurred. The army, in a Facebook post, said the troops stationed at the checkpoint “repelled” the Shi’ites after they attacked them and police officers on duty. “Troops of the Nigerian army deployed on routine duty at Kugbo/Karu bridge checkpoint of the Federal Capital Territory (FCT) were attacked by the Islamic Movement in Nigeria (IMN) sect at about 3:00pm on 29th October 2018,” the statement read. “The sect in massive numbers forced their way into the troops checkpoint after overrunning the police force. The police withdrew back to own troops position to join efforts to repel them. “They fired weapons at own troops, throwing bottle cannisters with fuel, large stones, catapults with dangerous objects and other dangerous items at troops causing bodily harm and stopping motorist movement, breaking their windscreen and causing heavy traffic. “However, troops repelled the attack in conjunction with the Nigerian Police Force to stop the situation from further deteriorating. The Nigerian army said it will “not deter in carrying out its constitutional roles and also safeguarding law-abiding citizens”.